better your health and get activeThe Fitbit Charge 3 in Blue Grey/Rose Gold is a touchscreen fitness activity tracker made with durable Rose Gold aluminium materials and comes with small and large sizes. 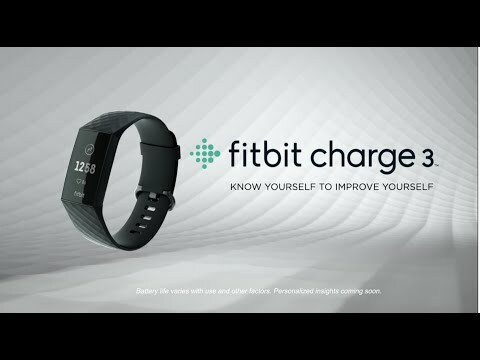 Improve your lifestyle with Fitbit Charge 3, the smart health and fitness band bursting with many innovative features to better your understanding of your own health and body. This wireless health band uses 24/7 heart rate and personalised data to keep you updated with real-time notifications to reveal what’s below the surface. Fitbit Charge 3 Fitness Activity Tracker, Blue Grey/Rose Gold, Water Resistant, 24/7 Heart Rate is rated 3.7 out of 5 by 3. Rated 5 out of 5 by rumburak from Actually pretty good! Got 2 as gifts. One with NFC been using for 4 months. Just do the firmware updates and it will be fine. There was a problem once where it wouldn't light the screen so it needed the charger to be able to reboot. The other just bought will be opened on Easter. Very good for sleep tracking. Very nice as bracelet or watch, also battery is 1 week with permanent wearing but no specialized tracking such as gym sessions. There are also some cheap chinese rose gold steel bracelets for it on Amazon that go really well with the watch! BTW best price was both times at Scan and they came fast and sealed. Rated 5 out of 5 by atreds from Good value, easy to use Bought for my wife, not a technophile and she can work it out!